Mega Sale! 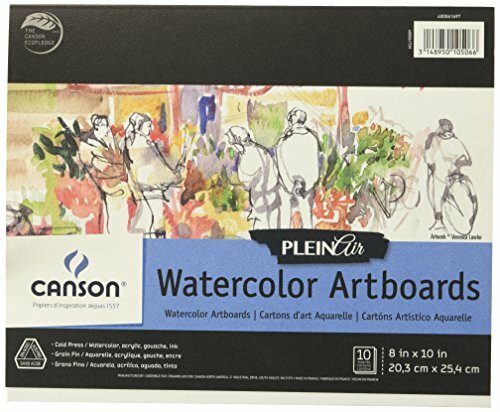 Save 29% on the Canson Plein Air Watercolor Art Board Pad for Watercolor, Ink, Gouache and Acrylic, 8 x 10 Inch, Set of 10 Boards by Canson at Designers Artists. MPN: 400061697. Hurry! Limited time offer. Offer valid only while supplies last. Plein air art board pads are the perfect companion for any artist. These pads enable the artist to express their creativity indoors and outdoors. Plein air art board pads are the perfect companion for any artist. These pads enable the artist to express their creativity indoors and outdoors. These pads contain 10 Rigid art Boards that are glued on one side. Plein air art board Montval watercolor pads are a cold Press, mold-made, French paper that performs beautifully with all wet media. The surface withstands scraping, erasing, and repeated washes. This pad is 8 inch x 10 inch of acid free Boards.